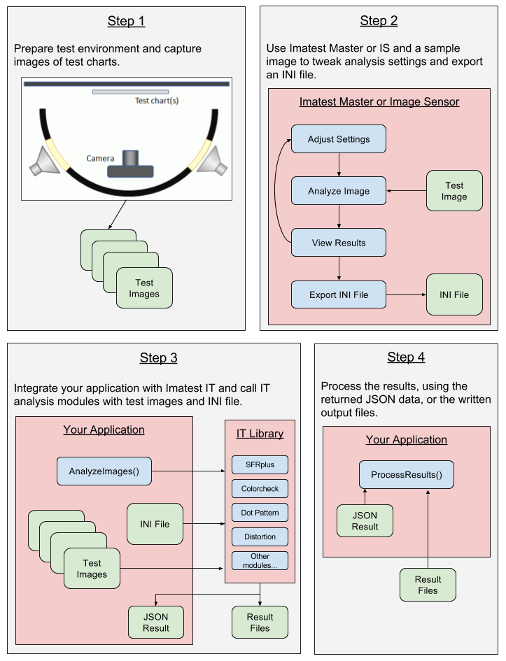 Imatest IT (Industrial Testing) is a set of Application Programming Interfaces (APIs) that allow developers to access Imatest’s powerful image quality analysis tools in their own custom applications. Imatest IT is available for 64-bit Windows and Linux, and includes libraries for use with C, C++, Python, .NET (including C# and Visual Basic), and LabVIEW, and also contains standalone executables that can be called from a command line or script. The API libraries perform the exact same calculations as the corresponding GUI-based Imatest Master modules. Imatest IT is a complete package that includes the module libraries, support documentation, sample code, and complete applications that interface with the modules. Although Imatest IT operates independently of Imatest Master and Image Sensor, we strongly recommend that IT users have at least one Master or IS installation on site. Imatest Ultimate Edition, which includes both IT and Image Sensor at a significant discount, is the ideal option for most users. As you will see in Step 2 below, setting up your test configuration, an integral part of any IT application, is much easier using Master or IS. As illustrated in this graphic, working with Imatest IT is a four-step process. Each of these steps is outlined in detail in this article. Imatest’s analysis modules require correctly framed and properly lit images of test targets. Once your test environment is properly set up, capture images of the required test targets for the modules you will be using. Using a sampling of the test images captured in Step 1, use Imatest Master or Image Sensor to analyze the image files, choosing the options required for your application, and setting the Regions of Interest (ROIs) for your charts. Once everything is ready, export the INI file and keep it with your application source files. In Imatest 5.0+ you can use the Save ini file for button in the Imatest IT settings window to save an ini file with only the needed sections. Code your application using your preferred programming language and call the module functions with your images and INI file. Load the analysis results and use them however you wish. If you have not already downloaded Imatest IT, you can do so on the download page. Next, follow the installation instructions found here. After Imatest IT has successfully installed, you will need to activate it on your computer. Follow these instructions to activate your node-locked or floating license. If the computer running Imatest IT does not have an internet connection, you can also choose to activate it offline. For more information on editing environment variables, see this article. The first time you use the Imatest IT libraries, they must be unpacked to a temporary directory. This can take several seconds, depending on your system. In some use cases, this can happen on every use, especially if you are using the Imatest IT Acquisition Library. To prevent the repeated unpacking of the IT libraries, you need to set two more environment variables: MCR_CACHE_ROOT and MCR_CACHE_SIZE. The MCR_CACHE_ROOT variable tells the Matlab Runtime where to extract the Imatest IT libraries. Setting it to a specific location that has write access for all users ensures that this cache will not be deleted by the operating system when it cleans up temporary files. The MCR_CACHE_SIZE variable is the size, in bytes, that the Matlab Runtime cache is allowed to grow to before other libraries are deleted. To keep Imatest IT running at top performance, it should be set to at least 900000000, and will result in much faster startup times for Imatest IT for some users. Follow the instructions here to add these variables to your environment. Select your preferred interface below to see detailed instructions. In order for your application to interface with the Imatest IT C or C++ DLLs, your system needs to know where to find them. Add the library’s directory to your system’s PATH or LD_LIBRARY_PATH variable (recommended). 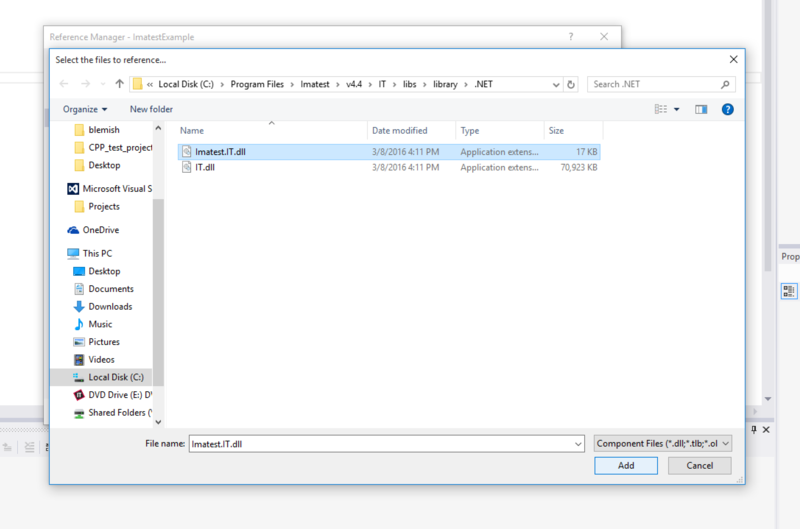 Copy the DLLs to the same directory as your application. Add the following directory to your system’s PATH (Windows) or LD_LIBRARY_PATH (Linux) variable, depending on which interface you will be using. For instructions on how to do this, see Editing System Environment Variables. Note: Linux users may already have completed this step by following the Additional Installation Steps above, if you are using the C++ library. If you prefer not to change your PATH or LD_LIBRARY_PATH variables, you can also reference the Imatest IT DLLs by copying them to the same directory as your project’s executable. Visual Studio users can automate this process by adding a Post-Build Event. In the Solution Explorer, right-click on the project and select Properties. Under Configuration Properties and Build Events, choose Post-Build Event. copy /Y "C:\Program Files\Imatest\v4.5\IT\libs\library\c\imatest_library.dll" ";$(TargetDir)"
copy /Y "C:\Program Files\Imatest\v4.5\IT\libs\library\cpp\imatest_library.dll" "$(TargetDir)"
Repeat these steps for each configuration in your project. Now, the imatest_library.dll file will be copied to your project’s target directory automatically and will be able to be loaded by your application. The Imatest IT Python Interface is shipped as a Python module. Before referencing it in your scripts, you will need to install it using Python’s package manager. This must be done on the command line, and requires Administrator access. If you don’t know how to open a Command Prompt with Administrator privileges in Windows, see this helpful article. Note: Imatest IT only supports Python versions 2.7, 3.3, and 3.4. Python 3.5 support will be available in Imatest IT 5.0, coming soon. First, navigate to the Imatest IT Python library directory. You will now be able to reference Imatest IT in your Python scripts using the import statement. There are no more additional installation steps required to use the Imatest IT .NET libraries. To simplify calling the Imatest IT EXE programs from the command line or a script file, the Imatest IT bin directory should be part of your PATH environment variable. Windows In Windows, this is done automatically during installation, but if you are getting errors like “sfr.exe is not recognized as an internal or external command, operable program or batch file” when trying to run the EXE programs, you may need to manually add the bin directory to your PATH environment variable. Follow these instructions and add C:\Program Files\Imatest\v4.5\IT\bin to the system PATH variable. You will need to open a new command window for the change to take effect. Linux On Linux systems, you will need to manually add $PATH:/usr/local/Imatest/v4.5/IT/bin to the PATH variable. See these instructions. Imatest’s analysis modules require correctly framed and properly lit images of test targets to produce accurate results. For information on setting up your image testing environment, see this article. Imatest offers a wide range of test charts to improve the accuracy of your image analysis. Besides the test image, the other important input for all Imatest IT module functions is an INI configuration file. 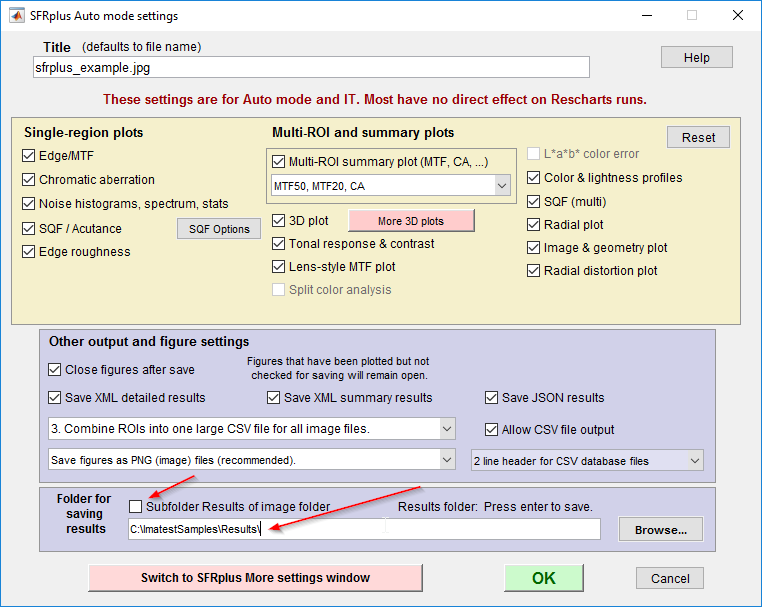 The INI file contains settings that are used by Imatest modules to describe the input image (such as the ROI [region of interest]), how the analysis should be calculated, and where to write output files. Before using Imatest IT in your application, you will need to configure one or more INI files to customize the analysis for your specific testing needs. First, you will want to configure the Imatest IT-specific settings. Do this by choosing Settings then IT & Pass/Fail Settings… from the main window menu bar. For a detailed explanation of the IT-specific settings found in this window, see this article. After you have made your changes, click OK.
Once you have an image file of your test target that matches the framing and dimensions of the tests you will run using Imatest IT, analyze it using Imatest Master or Image Sensor with the modules you require. Be sure the image has the same pixel count as the images that will be used in your production environment. Continue repeating the tests with different settings until you have the results you require. Once you are configured all of the required IT settings and set up test settings that fulfill your requirements – including the Region of Interest (ROI), calculation details, output files, and folder locations – go back to the main Imatest window, and choose INI File Settings then Save Settings… from the menu bar. Choose a location for the INI file and give it a useful name. This file will be the second input when calling Imatest IT module functions. Imatest 5.0+: You can use the Save ini file for button in the Imatest IT settings window to save an ini file with only the needed sections. Now that you have your test images and INI files all prepared, you are ready to integrate your application and analyze the images using Imatest IT’s module functions. Note: Imatest 4.5 and newer only supports 64-bit architectures. You must use the x64 platform configuration when using Imatest IT in your projects. You may need to manually add this platform configuration to your project first. For information on how to do this, see this article. Next, initialize the Matlab MCR application state by calling mclInitializeApplication(const char **options, int count). Most users can ignore the options and count parameters; just pass in NULL and 0, respectively. The function will return 0 if successful, allowing you to trap errors and handle them gracefully. This should only be called once during the life of your application. The last initialization step is to call imatest_libraryInitialize(). This will prepare the Imatest IT library for use. The function also returns 0 if it is successful. The Imatest IT C library encapsulates all input and output arguments inside mxArray types. This is a generic pointer type that can represent any data type. See below for more information on using mxArrays. The number of expected output arguments. This will always be 1 for the JSON result string. The output object, which will be a string wrapped in an mxArray. Image file path. A full path name may be used (and is recommended), such as “C:\Program Files\Imatest\v4.5\IT\samples\images\sfr_example.jpg”. If a relative path name is used, the path is relative to your calling program, not the value of the rootDir parameter. Multiple files can be analyzed by using a wildcard (*) symbol in the path. For example, if the inputFile parameter is “C:\Imatest\iPhone6_*.jpg”, all .jpg files in the folder C:\Imatest with filenames beginning with “iPhone6_” will be analyzed. Directory containing your INI file. If you do not pass a file path in as the first item in the varargin parameter, then Imatest IT will use a file named imatest-v2.ini found in this directory as your INI configuration. This value should always be the string “JSON”. XML output has been deprecated. String containing one of the following operation codes, which tells Imatest IT how to analyze your image(s), and how to read the values contained in the varargin parameter. If you are supplying your own full path to an INI file, and it is the first item in the varargin collection, then use one of these values: -7, -8, -10, or -17. If your INI file is named imatest-v2.ini and resides in the directory passed in as rootDir, then use one of these values: -5, -6, -9, and -15. The different opCode values direct how Imatest IT will behave. For more information on the different op modes supported by Imatest IT, see this article. This is a catch all array structure for other parameters required by the various opModes. The contents of this array depend on which op mode you are using, and on how many images you will be processing. For information on how to populate this array, see here. The Imatest IT C library receives and returns data via mxArray pointers. The Matlab MCR provides helper methods for allocating, interacting with, and deallocating mxArray structures. Most of the Imatest IT C library input parameters (with the exception of varargin and raw image data passed in when using direct read mode) are strings (const char*) wrapped as mxArrays. You can create these mxArray pointers by using the mxCreateString(const char *str) function. Before your program terminates, you must deallocate all of your mxArray pointers using the mxDestroyArray(mxArray *pm) function, and then set the pointers to NULL. The varargin parameter is a Matlab Cell Array containing zero or more additional input parameters, depending on the op mode. To initialize this parameter, use the mxCreateCellMatrix(int rows, int columns) function. You should create the varargin cell array with the exact number of cells required for your op mode. The rows parameter should always be 1, and the columns parameter should be the number of parameters you will be supplying. You can then set the individual cells using mxSetCell(mxArray *array, int index, mxArray *value), where array is the varargin pointer, index is a zero-based index, and value is an mxArray pointer to the value being added to the array. The varargin parameter is deallocated in the same way as other mxArrays, and you should not deallocate the individual cells of the array. Now that the library is initialized, and all of the input parameters are set up, it is time to call the Imatest IT analysis function. This example uses the SFR module, but the same code can be used to call the rest of the Imatest modules (with the exception of OIS, which has different inputs). The first parameter will always be 1, and the second is a reference to an mxArray* pointer that will contain the JSON output of the analysis. If the function returns false, it means an error has occurred. Check the stdout and stderr streams for details on what went wrong, and see the section Error Handling below for information on handling errors gracefully. When the call is successful, the JSON output will reside inside the outputJSON pointer. You can extract the string using the mxArrayToString(const mxArray *array_ptr) function. When you are finished making calls to the Imatest IT C library, you then need to make three more function calls to terminate the library and the Matlab MCR. Next, initialize the Matlab MCR application state by calling mclInitializeApplication(const char **options, int count). Most users can ignore the options and count parameters; just pass in NULL and 0, respectively. The function will return 0 if successful, allowing you to trap errors and handle them gracefully. The Imatest IT C++ library encapsulates all input and output arguments inside mwArray objects. This is a generic wrapper class that can represent any data type. See below for more information on using mwArrays. The output object, which will be a string wrapped in an mwArray object. This is a catch all array structure for other parameters required by the various op modes. The contents of this array depend on which op mode you are using, and on how many images you will be processing. For information on how to populate this array, see here. The Imatest IT C++ library receives and returns data via mwArray objects. Unlike the C library, the C++ library’s mwArray class is object-oriented, and also takes care of allocating and deallocating automatically. There is no need to manually destroy the mwArray objects. Most of the Imatest IT C++ library input parameters (with the exception of varargin and raw image data passed in when using direct read mode) are strings (const char*) wrapped as mwArray objects. You can create these mwArray pointers by passing a const char* into the constructor. The varargin parameter is a Matlab Cell Array containing zero or more additional input parameters, depending on the opMode. To initialize this parameter, use the mwArray(int num_rows, int num_cols, mxClassID mxID) constructor, passing 1 for num_rows, the number of extra arguments required as num_cols, and the constant mxCELL_CLASS as mxID. The num_cols value should be the exact number of cells required for your op mode. See this article for more information on populating the varargin parameter. You can then set the individual cells using the mwArray object’s Get(int row, int column) and Set(const mwArray& arr) methods. Note that the row and column parameters are 1-based indexes. The first parameter will always be 1, and the second is a reference to an uninitialized mwArray variable that will contain the JSON output of the analysis. If the function throw an exception, it means an error has occurred. Check the exception messages and stdout and stderr streams for details on what went wrong. See the section on Error Handling below for more information on catching and handling exceptions gracefully. When the call is successful, the JSON output will reside inside the outputJSON pointer. You can extract the string by calling the mwArray.ToString() method, then converting that result to a const char*. Note that you must declare the mwString variable separately for this to work. When you are finished making calls to the Imatest IT C++ library, you then need to make three more function calls to terminate the library and the Matlab Runtime. Note: Imatest 4.5 and newer only supports 64-bit architectures. You must use the 64-bit version of Python when using Imatest IT. Next, create an instance of the ImatestLibrary class. Behind the scenes, the ImatestLibrary constructor will start up the Matlab MCR Runtime and load all the IT libraries into memory. This will take a few seconds the first time you run it, but should be faster on subsequent runs, especially if you have set your system’s environment variables to the recommended values as described above. Image file path. A full path name may be used (and is recommended), such as “C:\Program Files\Imatest\v4.5\IT\samples\images\sfr_example.jpg”. If a relative path name is used, the path is relative to your calling program, not the value of the root_dir parameter. Multiple files can be analyzed by passing in a list of file names, or by using a wildcard (*) symbol in the path. For example, if the input_file parameter is “C:\Imatest\iPhone6_*.jpg”, all .jpg files in the folder C:\Imatest with filenames beginning with “iPhone6_” will be analyzed. Directory containing your INI file. If you do not pass a file path in as the ini_file parameter, then Imatest IT will use a file named imatest-v2.ini found in this directory as your INI configuration. String containing one of the following operation codes, which tells Imatest IT how to analyze your image(s), or if you are using Direct Read mode. Valid values for the op_mode parameter are found in constants of the ImatestLibrary class: ImatestLibrary.OP_MODE_SEPARATE, ImatestLibrary.OP_MODE_SIGNAL_AVERAGE, ImatestLibrary.OP_MODE_TEMPORAL, and ImatestLibrary.OP_MODE_DIRECT_READ. For more information on the different op modes supported by Imatest IT, see this article. If you want to use an INI file that is not named imatest-v2.ini, you will need to supply the path to the file as the ini_file parameter. The raw image data. Only used when using OP_MODE_DIRECT_READ. For more information on direct read mode, see this article. A JSON string containing metadata about how to interpret the image in the raw_data parameter. Only used when using OP_MODE_DIRECT_READ. For more information on direct read mode, see this article. It’s easiest to call the sfr using named parameters, as shown below. An exception will be thrown if something goes wrong – you should catch it and handle it gracefully. Check the exception message and stdout and stderr streams for details on what went wrong, and see the Error Handling section below for more information on gracefully handling exceptions. When the call is successful, the function will return a string containing JSON-encoded output. When you are finished making calls to the Imatest IT Python library, you then need to call terminate_library() to unload the library and the Matlab Runtime. To use the Imatest IT .NET libraries in your Visual Studio project, first you need to add a reference to the library DLL in your project. 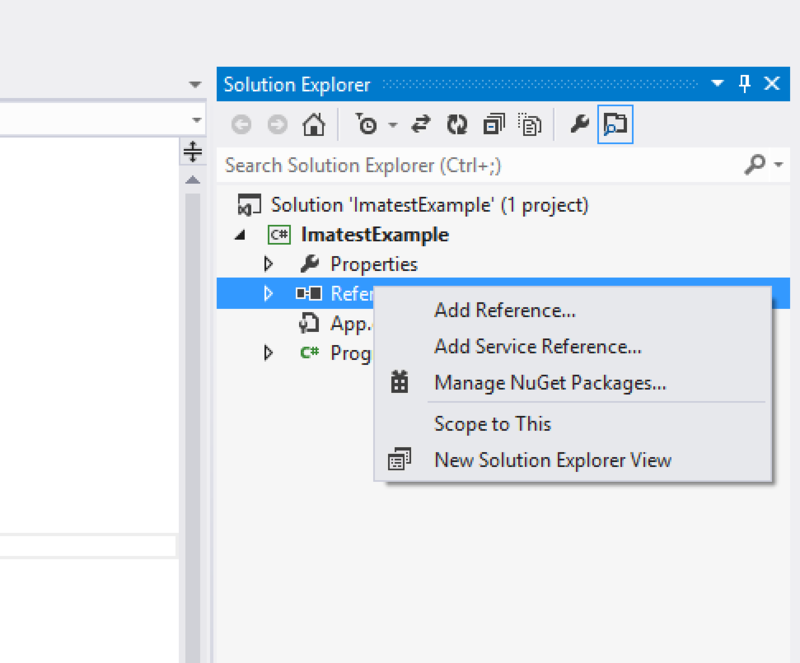 Once your project is created in Visual Studio, right click on the References section of the Solution Explorer and choose Add Reference…. In the Reference Manager window, choose Browse on the left-hand side, then click the Browse… button at the bottom. Navigate to the .NET library directory of your Imatest IT installation (by default, C:\Program Files\Imatest\v4.5\IT\libs\library\.NET\), choose Imatest.IT.dll, and click the Add button. Note: You do not need to add the IT.dll reference to your project. 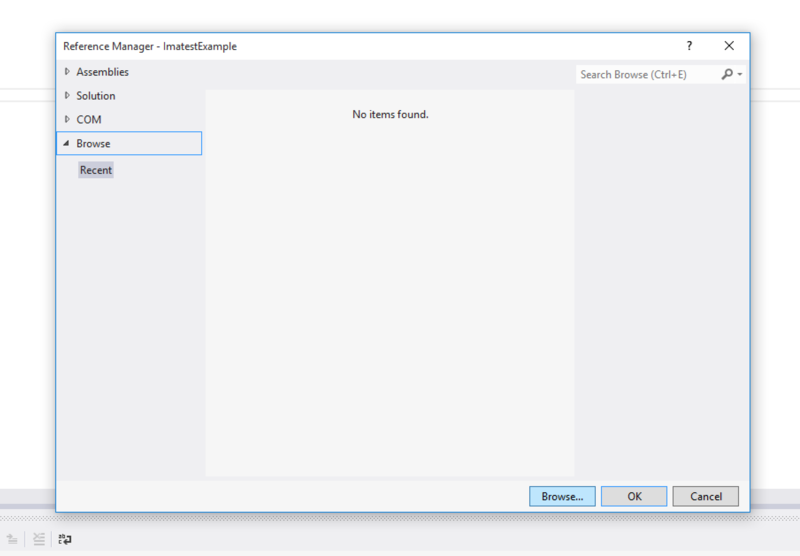 Click OK to close the Reference Manager window. Note: Imatest 4.5 and newer only supports 64-bit architectures. You must use the x64 platform when running .NET applications. The Any CPU platform will throw runtime errors. Next, create an instance of the Imatest.IT.Library class. Behind the scenes, the Imatest.IT.Library constructor will start up the Matlab MCR Runtime and load all the IT libraries into memory. This will take a few seconds the first time you run it, but should be faster on subsequent runs, especially if you have set your system’s environment variables to the recommended values as described above. Imatest.IT.Library implements the IDisposable interface, and we recommend that you wrap your library instance inside of a using statement to ensure that the Dispose() method is called properly. The Dispose() method cleans up the Matlab Runtime, and also releases your floating license seat, if you are using a floating license. Directory containing your default INI file. If you do not pass a file path in as optional the iniFile parameter, then Imatest IT will use a file named imatest-v2.ini found in this directory as your INI configuration. Multiple files can be analyzed by using a wildcard (*) symbol in the path. For example, if the input_file parameter is “C:\Imatest\iPhone6_*.jpg”, all .jpg files in the folder C:\Imatest with filenames beginning with “iPhone6_” will be analyzed. A list of image file paths. Full path names may be used (and are recommended), such as “C:\Program Files\Imatest\v4.5\IT\samples\images\sfr_example.jpg”. If relative path names are used, the path is relative to your calling program, not the value of the rootDir parameter. Enum value for one of the available operation modes, which tells Imatest IT how to analyze your image(s). Valid values for the opMode parameter are: OperationMode.Separate, OperationMode.SignalAverage, and OperationMode.Temporal. For more information on the different op modes supported by Imatest IT, see this article. If you want to use an INI file that is not named imatest-v2.ini, you will need to supply the path to the file as the iniFile parameter. The raw image data. Only used if you are passing in image data directly using Direct Read Mode. For more information on direct read mode, see this article. A an object containing metadata about how to interpret the image in the inputBytes parameter. Only used when using Direct Read Mode. For more information on direct read mode, see this article. Enum value for one of the following operation codes, which tells Imatest IT how to analyze your image(s). Valid values for the opMode parameter are: OperationMode.Separate, OperationMode.SignalAverage, and OperationMode.Temporal. For more information on the different op modes supported by Imatest IT, see this article. We recommend always wrapping your Imatest IT calls in try/catch blocks. If anything goes wrong, an Exception will be thrown. You should handle these exceptions gracefully. Check the exception message for details on what went wrong, and see the section on Error Handling below for more information. The Imatest IT EXE Library can be called using Windows or Linux script files. We recommend making sure that the IT bin directory is in your PATH variable. On Windows, this should already happen when Imatest IT is installed. You may need to add to your path manually on Linux. For more information on viewing and editing system environment variables, see this article. One of the following operation codes, which tells Imatest IT how to analyze your image(s). Valid values for the op_mode parameter are: -1 (Separate Analysis), -11 (Signal Average Analysis), and -12 (Temporal Noise Analysis). For more information on the different op modes supported by Imatest IT, see this article. Image file path. A full path name may be used (and is recommended), such as “C:\Program Files\Imatest\v4.5\IT\samples\images\sfr_example.jpg”. If a relative path name is used, the path is relative to your calling program. The location of the Imatest IT bin directory. By default, this will be “C:\Program Files\Imatest\v4.5\IT\bin” on Windows, and “/usr/local/Imatest/v4.5/IT/bin” on Linux. The full path to the INI configuration file you will be using. The directory where Imatest IT’s output files will be written to. The path(s) to other images that will be analyzed besides the initial input-file image. Imatest IT EXE modules are called using the command line, or in .bat files. Note: You should not include a trailing ‘\’ when passing in directory names, otherwise you may get an error (see here). When the module is finished running, the result files will be written to the result-directory folder (in this case, C:\ImatestSamples\Results). The Imatest IT module functions output their results as JSON, XML, and CSV formatted text files. The C, C++, Python, and .NET libraries also return results as a JSON formatted string to the calling program. Imatest IT’s JSON result string, which is returned to the calling program, can be parsed and processed using third party JSON libraries. A list of JSON libraries for several languages can be found at json.org. Note: If you analyze multiple files in a single call, only the last file’s results will be returned to the calling program. The others will be written to output files in the Results directory. If you find that a result you need is missing from the returned JSON, please contact us and we can add it in the next minor release of Imatest IT. Performance Tip: If you do not need some or all of the output files, you can disable them using the same Auto mode settings window. This will make your Imatest IT calls run a little faster. Just uncheck each of the outputs that you do not require. Select your preferred interface below to see the best ways to handle errors using Imatest IT. In the Imatest C library, if an error occurs within one of the analysis module functions, a false result will be returned. You can then use the mlfGetExceptionID(int nargout, mxArray** errID, mxArray** errName) function to extract an Error ID and Error Name, which map into the Imatest IT Exception Hierarchy. To make handling these exceptions easier, Imatest IT includes an optional header file, imatest_exception_IDs.h, which maps each of the Error IDs to an enum. To include this header file, add #include “imatest_exception_ids.h” to your source file. You can read more about the Exception Hierarchy here. In the Imatest C++ library, if an error occurs within one of the analysis module functions, an mwException will be thrown. If you catch the exception, then you can use the getExceptionID(int nargout, mwArray& errID, mwArray& errName) function to extract an Error ID and Error Name, which map into the Imatest IT Exception Hierarchy. In the Imatest Python library, if an error occurs within one of the analysis module functions, an ImatestException will be thrown. If you catch the exception, then you can get more information about using the error_id, error_name, and message properties. In the Imatest .NET library, if an error occurs within one of the analysis module functions, an Exception will be thrown. If you catch the exception, then you can get more information about it by calling the ImatestLibrary.GetLastException() and ImatestLibrary.GetExceptionName() methods. In the Imatest EXE library, if an error occurs within one of the analysis module functions, the return code from the executable will be -1 instead of 0. If you are calling the executable from a batch script, you can check what the return code was to determine if an exception occurred or not. sfr.exe "-1" "'C:\ImatestSamples\sfr_example.jpg'" "'C:\Program Files\Imatest\v4.5\IT\bin'" "'C:\ImatestSamples\imatest-v2.ini'" "'C:\ImatestSamples\Results'"
Imatest IT for Windows also comes with a sample GUI application that demonstrates integrating the IT .NET libraries in a full-featured GUI application. Using the example images provided in the samples folder, you can experiment with the different analysis modules. It also provides a simple way to interact with the Imatest Acquisition Library. Using this app, you can quickly connect and test any of the supported image capture devices and make sure they are working, without writing any code. The full source code for this app is included in the .NET C# samples folder. Images can be passed directly into Imatest IT as byte arrays using Direct Read Mode. The images can be processed RGB or RAW. Direct Read Mode is generally much faster than passing in image file paths, since the data is already in memory and does not need to be read from disk. Although it does require more initial setup effort, if your application is speed-critical or high-volume, we strongly recommend using Direct Read Mode. For detailed instructions on using Imatest IT’s Direct Read Mode, see this article. Images can be directly acquired in your application from supported devices using the Imatest IT Acquisition Library (C, C++, and .NET only). For more information on the C and C++ version of the Acquisition Library, see this article. For the .NET version, see this article. Pass/Fail results are included in the JSON results for those modules that support it (Blemish, Colorcheck, Distortion, Multitest, SFR, SFRplus, eSFR-ISO, Random, Star, Stepchart, and Uniformity). If you have configured Pass/Fail criteria, and included the Pass/Fail file in your INI file, then the tests will be run, and the results will be included as a separate JSON object called “passfail”. For more information on implementing Pass/Fail in Imatest, see this article. By default, the Imatest IT modules print some information to the standard output or console. If your application does not have a console, or you want to store this output in another way, it is possible to redirect the standard out and standard error outputs. To redirect output text using the Imatest C or C++ libraries, you need to use the function imatest_libraryInitializeWithHandlers(mclOutputHandlerFcn error_handler, mclOutputHandlerFcn print_handler) instead of imatest_libraryInitialize(), passing in two pointers to functions that will handle the “error” and “standard” outputs, respectively. The functions accept a const char* input, and return an int, which is the number of characters processed. To redirect output text using the Imatest Python library, you need to pass in StringIO objects to the ImatestLibrary() constructor, as the stdout and stderr named parameters. You can extract the contents of these objects using the getvalue() method, and should call close() on them at the end of your script. To redirect output text using the Imatest .NET library, you need to use the Console.SetOut(TextWriter writer) and Console.SetError(TextWriter writer) methods. You must call these methods before creating the Imatest.IT.Library object. To redirect output using the Imatest IT EXE interface, use the typical command line syntax you normally would use. With the Imatest IT .NET library, you can easily use write asynchronous module calls in your custom applications using the .NET Framework’s async and await keywords along with Imatest IT .NET’s JSONAsync() methods. Making these simple changes can have dramatic effect on the responsiveness of applications, especially if they are GUI-based. To see the difference in action, run the Imatest IT .NET Sample Application found at C:\Program Files\Imatest\v4.5\IT\samples\.NET\ImatestITSampleProject\ImatestITSampleProject.exe and try both the Run and Run Async buttons. You will notice the application appears to freeze when using the non-async version, but is fully responsive when using the async methods. Add an async modifier to the signature in which the asynchronous code will be called. Add the await in front of the Imatest IT method call. Change the Imatest IT method call to use the new Async version. /// Library.CreateAsync() method has returned a Library object. using the new parallel_analyzer function. To use the parallel_analyzer, first create a list of analysis tasks that need to be run. Each task will be assigned to a different parallel process. The number of available concurrent processes depends on how many cores your machine has, though you can tell Imatest IT to use fewer cores if you need. nargout int The number of expected output arguments. This will be set to 1.
tasks const mwArray& [mxSTRUCT_CLASS] The array of analysis tasks to run. For further information see below. runParallel const mwArray& [bool] A boolean set to true if parallel analysis is desired, otherwise set to false for serial operation. numWorkers const mwArray& [int] The number of child processes to spawn. jsonMetaData – Image meta data in the form of serialized JSON object string. This field only needs to be filled when numeric arrays are being supplied. It is important to note that this array is 1-indexed. Creation of the remaining inputs is simpler; we use the mwArray contructors for scalar numeric values and strings. Lastly, we call parallel_analyzer_shell() with the inputs. If any exceptions occurred during processing, they will be reported in the errorID, errorMessage, and errorReport properties. While handling your results, you should always check whether the errorID property is empty or not before working with the data property. In addition to the parallel_analyzer sample, IT also includes a C++ sample project that implements parallel processing using the Boost.Interprocess Library (<IT installation root>\samples\cpp\CPP_parallel_test_project). More information can be found in this article. jsonMetaData – Image meta data in the form of serialized JSON object. This field only needs to be filled when numeric arrays are being supplied. taskFileName: The path to the JSON task file (see the Task File section below). runParallel: A boolean value that is 1 if the user wants parallel processing and 0 if serial processing is desired. numWorkers: An integer value indicating the number of child processes to invoke for analysis. The maximum value is the number of physical cores. -o|–output_filename <filename>: Supply the full file path for the file into which the results are saved. Note that either ‘-o’ or ‘–output_filename’ can be used. If this optional input is not supplied, the results are saved to a file named ‘results_<current date and time>.json’. Starting with version 5.0, Imatest IT now allows you to analyze several different images in parallel, using the new parallel_analyzer function. image_data_meta_data dict A dict object containing the direct read meta data, used to help interpret the raw byte data, and obtained by calling ImatestLibrary.build_json_args(). Required if using the image_data argument, not needed if using image_files. Starting with version 5.0, Imatest IT now allows you to analyze several different images in parallel, using the new ParallelAnalyzer.Execute() method. To use the ParallelAnalyzer, first create a List of ImatestTasks objects that contain images to be analyzed. Each task will be assigned to a different parallel process. The number of available concurrent worker processes depends on how many cores your machine has, though you can tell Imatest IT to use fewer workers if you need. imageMetaData DirectReadOptions An instance of the DirectReadOptions class that contains image meta data, used to help interpret the raw byte data. Starting with version 5.0, Imatest IT now allows you to call the new Arbitrary Charts module in using the new arbitrary_charts functions. For more information on the Arbitrary Charts modules, see this article. filename str (direct read only) The name of the file, used for results file names. extension str (direct read only) The extension key used to decode the direct read image bytes, as configured in the Read Raw screen of Imatest Master. The arbitrary_charts_separate function will analyze multiple inputs separately, while the arbitrary_charts_signal_average function will combine two images’ results into a single signal averaged result. chart_file str The path to the chart definition file. ini_file str The path to the INI file. options dict The dict object returned by calling ImatestLibrary.get_arbitrary_charts_options(). Filename string (direct read only) The name of the file, used for results file names. Extension string (direct read only) The extension key used to decode the direct read image bytes, as configured in the Read Raw screen of Imatest Master. The ArbitraryCharts.Separate methods will analyze multiple inputs separately, while the ArbitraryCharts.SignalAverage method will combine two images’ results into a single signal averaged result. chartFile str The path to the chart definition file. iniFile str The path to the INI file. options dict The ArbitraryChartOptions object. Can Imatest IT run multiple instances in Parallel?